Burger King Sweden has trolled McDonald’s once again after learning that its competitor has received some bad news last month. McDonald’s has lost its ‘Big Mac’ trademark in the EU to Irish fast food chain Supermac’s, and in this new ad, Burger King has leapt at the chance to poke fun at the company. Burger King has launched an entire menu called the ‘Not Big Mac’s’ menu to mock the ‘Big Mac’. 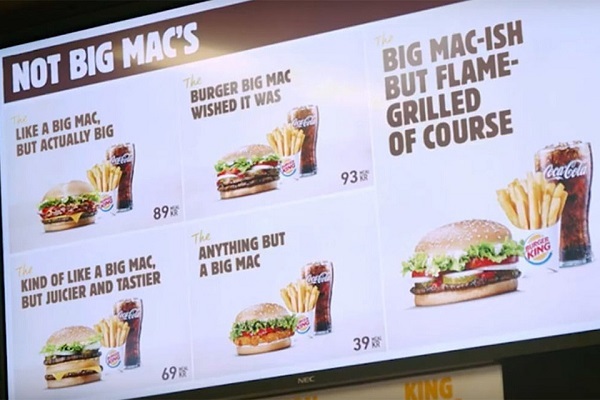 It includes meal options ‘like a Big Mac but actually big’, the ‘burger Big Mac wished it was’ as well as ‘kind of like a Big Mac, but juicier and tastier’. Other options include ‘the anything but a Big Mac’ and ‘the Big Mac-ish but flame grilled of course’. Watch the ad in the video below.